1. 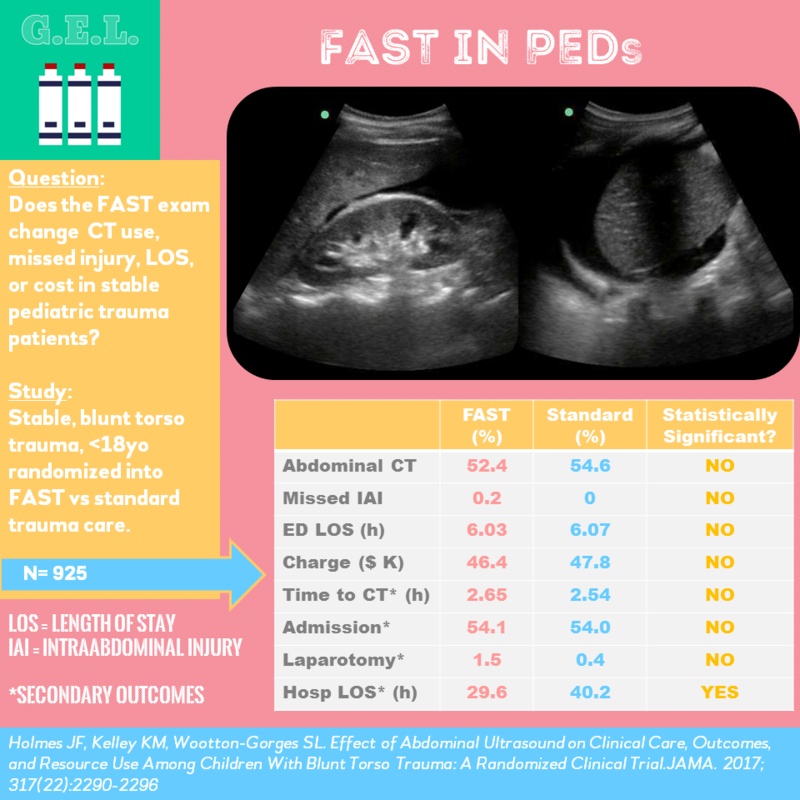 In this study, the FAST does not lead to a change in CT scans, missed intraabdominal injuries, ED length of stay, or hospital charge in hemodynamically stable pediatric patients. 2. The FAST is not sensitive enough to rule out intraabdominal injury in a hemodynamically stable pediatric trauma patients. 3. More research is needed to determine the appropriate way to incorporate the FAST exam into the evaluation of a stable pediatric trauma patient. Here's a similar study but in adult patients - Natarajan et al FAST Scan: is it worth doing in hemodynamically stable blunt trauma patients? 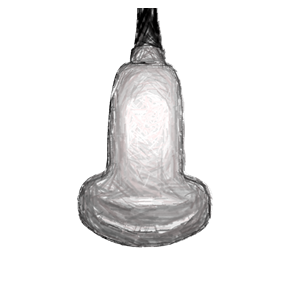 The FAST scan is used to identify hemoperitoneum or hemopericardium in trauma patients. There is adult literature to support that use of FAST decreases abdominal CT use, hospital length of stay (LOS), complications, and hospital charges, however there is a paucity of evidence supporting its use in pediatric trauma patients. This study attempted to determine if the FAST exam during initial evaluation of injured children improves clinical care. Does the FAST examination decrease abdominal CT use, ED LOS, and hospital charges without increasing the rate of misses intraabdominal injuries (IAI) when used in the initial ED evaluation of hemodynamically stable children with blunt torso trauma? No difference in rate of abdominal CT scans, missed intrabdominal injury (IAI), ED Length of Stay (LOS), or projected hospital charges. 1 missed IAI in FAST group. In this case, the patient received a CT - initially read as negative and was discharged home, Later the CT was overread as grade 1 liver laceration, patient came back for further observation. Among the 19 in the FAST arm who had IAI and fluid on CT, both the ED physicians and experts did not do great with FAST (example: 10 negative and 12 negative for each group. However the article does not mention where the fluid is or how much on CT.
Why did it take 2.5 hours to get a CT? - reassessing? wasting time? Really long FAST exams?! Long story short - we need some more studies to see if FAST would add anything to any of these strategies.